The trip was incredible! Each leg had its own special memories. In Victoria Falls, at Elephant camp, walking and sitting with Sylvester (the cheetah) was beyond words. I will go back to Elephant camp just to visit Sylvester again. 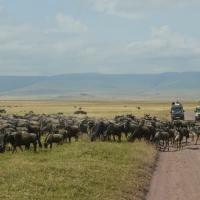 The Lewa Conservancy was a wonderful, unique and personally comfortable experience. The managers were so personable and the other clients were so social and fun to be with. I thoroughly enjoyed my visit and loved their perspective that everyone is a friend of theirs and they wanted everyone to feel like a special visitor. I was there when the Westgate issue happened. I asked to use their internet connection to let all my friends and relatives know I left Nairobi the day before and I was safe and sound at Lewa. They insisted I immediately send e-mails even though the office was closed. I spent my last night at the managers table and felt like family with their discussions. At Little Governers Camp I had an elephant walk just outside my tent, if I had a hole in the tent I could have actually touched the elephant. The warthogs had free range through the camp and in the swamp just outside the tent there were monkeys, hippos, elephants and warthogs. What and experience! Oliver was my driver and I absolutely loved him. He knew where to go to see the most exciting animal interactions. He kept in touch with every other driver to know where the action was. We would say we want to see a lion walking and he would find one. we would say we want to see a cheetah with a kill up a tree and he found it. We would say we want to see the wilderbeast migration and he would show us that! An amazing driver. I would ask for a tent at the outskirts of Governers camp. I was next to the bar and central activities and would have liked to be more separate from all the noise and activities.